Unfortunately, Cancer has become a common, everyday word that we hear. Friends, family, coworkers – we are all affected, whether its someone close to us or someone we see on TV. The chemotherapy process is long, and it leaves those going through treatment drained of energy and unable to live their every day normal life. After learning that a dear friend of mine was diagnosed with breast cancer earlier this year, I began to brainstorm ways that I could help make her days a little easier while going through chemotherapy (Did you know 1 out of every 8 women will be diagnosed with Breast cancer in her lifetime?!). 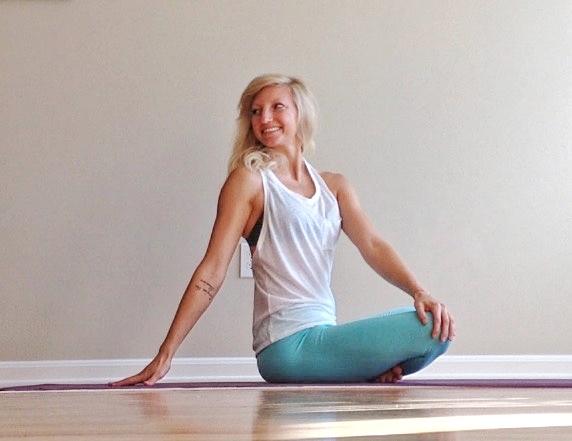 There isn’t much besides comforting words and actual gifts, so I decided to do some research and put together a few simple, modified yoga poses that could help increase energy, and even help manage pain. Below are a series of poses I have researched and put together information for my friend – and for anyone else going through cancer treatment. It can be hard to summon up any energy during treatment, so for those who are used to being active, these poses are a nice way to incorporate a little workout in your life. They will also help bring relief, as well as encourage movement to fight the fatigue and pain! 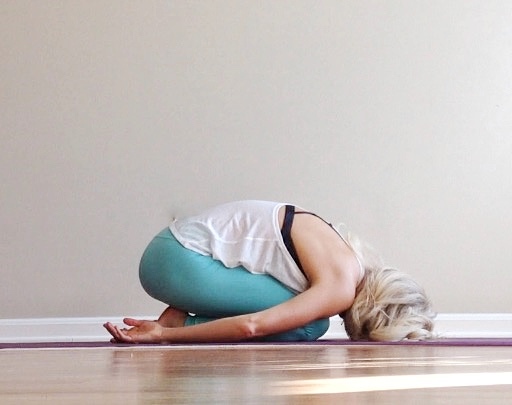 **Hold each pose below for 5-10 DEEP breaths. This helps brings body awareness, increases energy circulating throughout the body, and helps with fatigue. 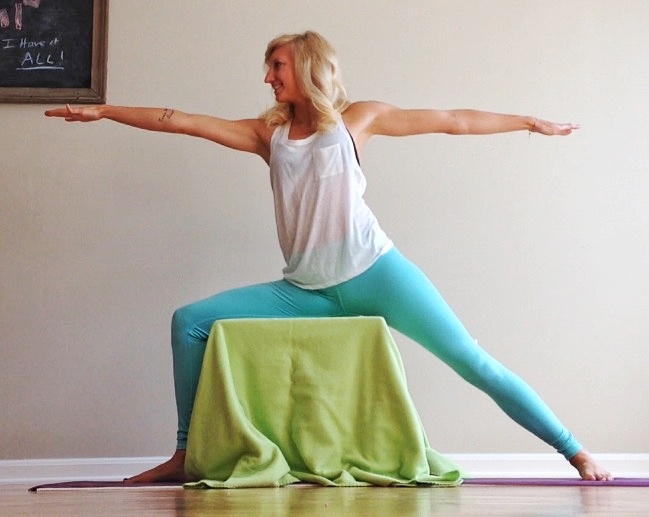 Body Position: Sit hips back on heels and lower your chest to your thighs, and head to ground. Bring arms over your head, or keep them at your side. 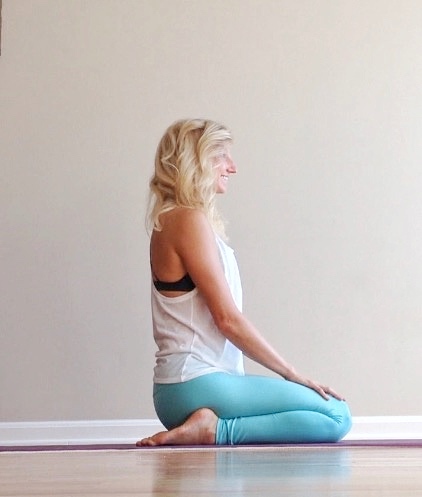 Body Position: Front leg bent, knee over ankle; back knee bent, resting on the floor; arms rest at side with chest raised, or hands are resting on blocks at sides for support. Body Position: Front leg bent, knee over ankle; hips open, back leg straight, grounding foot into the ground; arch of back foot should be in line with the heel of the front foot; hands at hips, or arms up, gaze over front fingertips. Body Position: Lay on back with pillow underneath the small of your back. Place your hands on your hips or keep them to your side. Hopefully this helps bring some relief for anyone going through cancer! There are a lot more poses that you can do, but I wanted to just give a few specifically focused on breast cancer. For those who have had cancer or know someone who has/is going through treatment – have you heard of Yoga benefits for cancer? If yes, what have you heard? I would love to learn more! The information I have provided is not intended to be used in place of professional medical advice. This is information that I have gathered on my own through a variety of sources, and if you decide to use/apply any of the ideas from my site, you are taking full responsibility for your actions. This information is not meant to diagnose or to treat any medical condition. Please consult with your primary care physician holistic doctor to diagnose/advise of any medical condition if you have any questions. I am not liable for any damages or negative consequences resulting from any action by any persons reading or following the information on this site. Great poses to help with stress, circulation, balancing the organs, stimulating the lymphatics. When everything is unbalanced, the bodies detox and digestion shuts down and toxins do their thing. Nutrient support is also key along with a stress reducing plan. I love the Wahl’s Protocol by Dr. Terry Wahls. It is a lifestyle way of eating that addresses inflammation/oxidation (causes cancer) and lack nutrients and sulfur, the 3rd most abundant mineral in your body. She calls her diet Paleo plus. So thankful for the poses and information Nina has provided! They have helped me through 20 weeks of chemotherapy. The poses are now part of my pre-surgery preparation. I love the simplicity of the poses, the information and the examples in pictures. Awesome Nina – thanks so much!